On Friday, April 7, explore contemporary art at the New Museum during our annual Teen Night, a special evening exclusively for teens! Grab your friends and enjoy live music and teen-led gallery experiences. Create zines and project digital drawings related to the exhibition “Raymond Pettibon: A Pen of All Work.” Then head up to the Sky Room, with its inspiring views of the Manhattan skyline, to design your own t-shirts while you witness the premier of video works produced by teen participants of the Museum’s Experimental Study Program (ESP), in collaboration with artist-in-residence A. K. Burns. 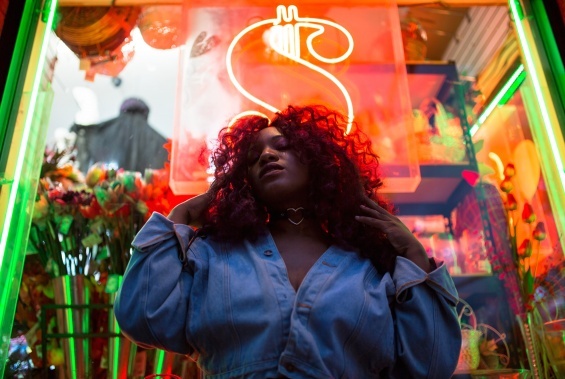 Finally, end the evening with a genre-defying dance music performance by DJ, rapper, producer, and vocalist UNIIQU3—first lady of the Jersey club movement! The New Museum’s mission is to promote New Art and New Ideas. School and Teen Programs utilize the Museum as a resource to enhance learning and engage high school students through the exploration of contemporary art in relation to local, global, and cultural issues that affect their lives. Visit our School and Teen Programs page for more information. Teen Night at the New Museum is a teen program developed in collaboration with the NYC Museum Teen Summit. The NYC Museum Teen Summit is a collective of youth leaders who represent different museums in New York dedicated to improving and promoting the role of youths in museums. New Museum school and teen programs are made possible, in part, by Con Edison, Bloomingdale’s, the May and Samuel Rudin Family Foundation, the New York State Council on the Arts with the support of Governor Andrew M. Cuomo and the New York State Legislature, and the New York City Department of Cultural Affairs in partnership with the City Council. Additional endowment support is provided by the Rockefeller Brothers Fund; the Skadden, Arps Education Programs Fund; and the William Randolph Hearst Endowed Fund for Education Programs at the New Museum.